A friend gave me a couple of tickets to the Rockies game a few days ago. 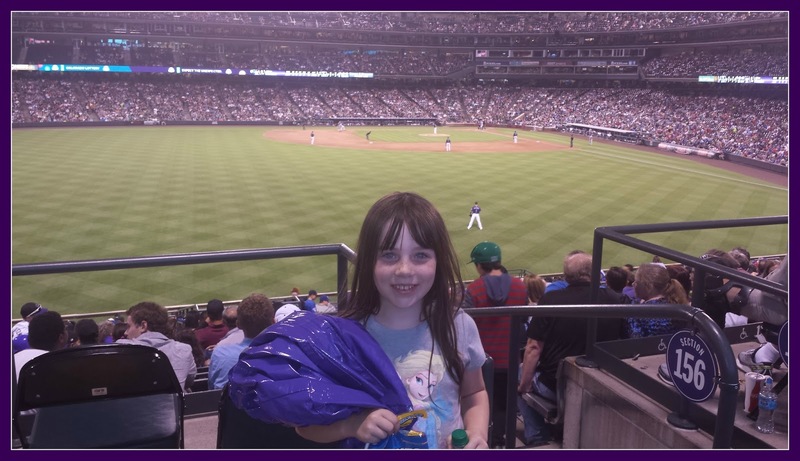 My oldest, Avery, had always had interest in the Rockies so I decided to take her for a daddy-daughter date. The Rockies were playing against the team I had watched before the Rockies inception so I was very excited to watch the game and excited to share it with Avery. Per Jacobson tradition, we were running late and even needed to get my sister involved with ticket pick-up. We parked the car, grabbed the tickets from my sister in an intersection in front of the stadium and walked inside just after the national anthem. My daughter's face was glowing as we walked in. I miss that sense of wonder when walking into a stadium. To her, the long lines and crowded walkways are part of the experience not the nuisances that grown-ups see them as. You could see her processing all of the information, her eyes bounced from sight to sight, like my mother in a row of slot machines. After a few minutes her eyes trained on a snack stand. We waited in a line that seemed forever but the conversation was great. She talked about her favorite player, Troy Tulowitzki, and wondered about the likelihood of him hitting a homerun that game. I said that he probably would, not fully believing it. She had never been to a Rockies game where he hadn't hit at least one. I quietly hoped he would keep the streak alive. We got to where we would order and I asked her what she wanted. After a brief discussion that cotton candy was not dinner, she settled on an unattractive slice of pizza and we found our seats. We missed the Rangers half of the first but got sat down in time to watch the Rockies take a quick lead and Avery seemed to be getting onto the game. 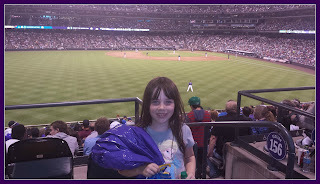 The Rockies continued scoring in the second and Avery and I discussed why Tulowitzki was her favorite player. To my chagrin it was because he had Justin Beiber's "Baby, baby, baby" as his theme music, but at least she was cheering, right? As if I planned it, Tulo came up to bat as we were having the discussion (with different theme music) and he promptly put a ball over the left field fence. He put the Rockies up 7-0 in the second inning. Avery shot out of her seat cheering. I'm sure that my smile would be tough to duplicate. I was in bliss. But then it changed, just a couple of inning in, she was ready for another snack. We went and got her some Dippin' Dots and she asked if we could go look at the kids area. She ate her snack and spent an inning in the kids zone. After that she asked if she could get a souvenir. "Of course, sweetheart." I responded wanting to see what was going on with the game. By the time we got the overpriced pom-pom into her hand the Rangers had begun to chip away at the Rockies lead and I hadn't seen a moment of it. My phone rang. It was my buddy Dave who had seats behind home plate. He was offering us a couple of innings in the seats. We went to meet him and I was excited about the prospect of using the seats. Dave made his way up the steps and he was grinning ear to ear. He had just caught a foul ball. The white whale to many a baseball fan. As excited as he was, the prospect of sitting anyplace a ball could actually land scared Avery and I begrudgingly let Dave know that he could have his seat back. After that Avery wanted to see how long it would take to walk the entire concourse of Coors Field. Incidentally, it takes the exact amount of time that it takes the Rangers to make a 7-0 game into a 7-6 game. I asked...no, I begged that we go back to our seats to finish watching the game. She responded by letting me know that the cotton candy, Sprite, Dippin' Dots and pizza had left her feeling "icky" and that she would like to go home. I didn't like it but the prospect of an ill child forced me to acquiesce to her demands. We left the stadium and made the long walk back to the car. I could hear the stadium erupt from time to time and somewhere deep down, I was down about having to leave. When we got back to the car I unlocked the doors and held hers as to keep her from banging the car next to us. She started into the car but then turned and hugged my leg. "That was the most fun ever!" she said into my navel. It was one of those moments that melt you. I hugged her hard and climbed into my seat. She was asleep before we left the parking lot. I listened to the rest of the game on the way home. The Rockies won 8-7 in the bottom of the ninth. The takeaway I had from this is simple: the thing that kept her from wanting to sit in her seat for the game was the same thing that made her able to look past the crowds and long lines. It is the sense of wonder that I envied in her. It's the fact that going to the game with her was about far more then the score at the end of the game, it's about the cotton candy and the overpriced baubles. It's about Tulo keeping our streak alive and the play zone and walking the entire stadium and trying to find Dinger. At the end of the day, I've been watching the game all wrong. Thank you, Avery. I love this post, Chris. You really capture her well.